It's the time of year when many of us gardeners are eagerly watching our tomato plants and hoping to see them ripen and give us a bumper crop. I was recently asked for tips on growing tomatoes so I figured two brains were better than one (even if the second one is a boy's!) so I decided to interview my BFF Euan. He has 98 (yes 98!) tomato plants at home and his Grandad is a proper expert on tomatoes. 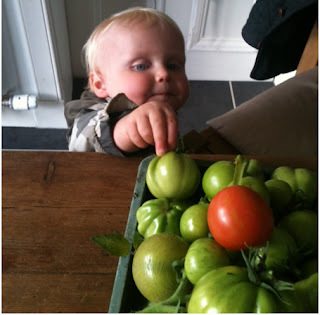 So read on for some top tips in my interview with Euan Boutell, tomato extraordinaire, aged 20 months! 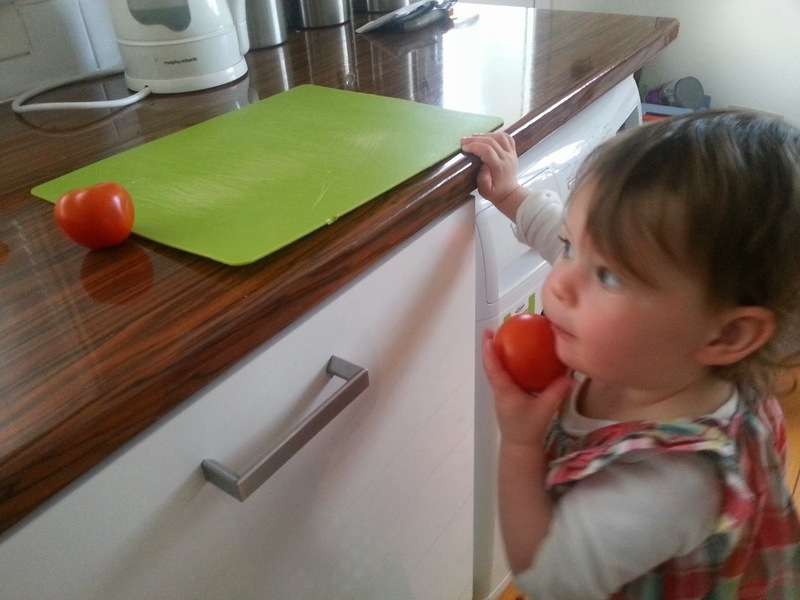 tomatoes a bit of a taste test first! Hiya Euan, I know that if you want to grow tomatoes for super cheap, it's best to grow them from seed. Plus it's great fun watching them sprout through the earth and grow big and strong like you and me! So, when would you say it's best to start sowing seeds? Well Lulu, if you are an expert in tomatoes like Grandad and me, it's best to start the seeds in February in a heated propagator. He says doing without heat will end up with weaker seedlings and scrawnier plants overall. However, this option might not be the best if you are a beginner with no equipment. So you can buy super plants in garden centres that have been given a good start and you can then just pot them on. Good advice Euan. And what would be a good variety for a beginner? Or a good variety for a pot on the patio if you don’t have a greenhouse? Moneymaker or Ailsa Craig are good red varieties and Golden Sunrise for a yellow. They are all pretty hardy and easily available. 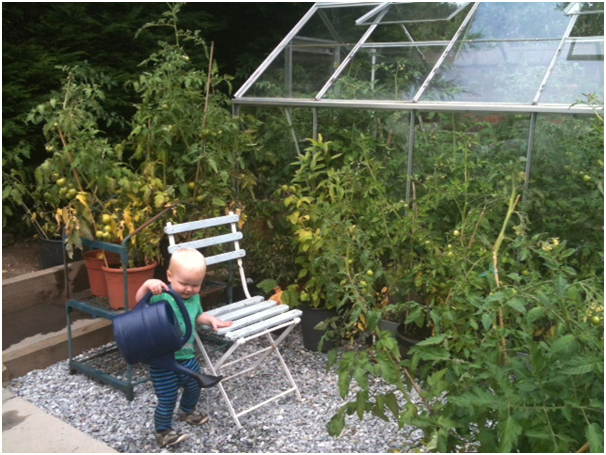 If you are growing in a pot outdoors a Tumbler is a great tomato plant. Super easy to grow and doesn't need any staking or worrying about pinching out. Add a few marigolds and nasturtiums in the same pot and you have a very pretty and tasty pot! . The "bush" varieties of tomato don't need staking, pinching out or grow so tall either so can be a good option for beginners. Tigerella, Gardener's Delight cherry. Centre is Ailsa Craig. And what is it best to sow seeds in - a tray? a biodegradable pot? Just in a normal seed tray is absolutely fine. But you can use pretty much whatever you have lying about the kitchen - a yoghurt pot would work well and we always have a lot of them Lulu! And what kind of soil would you grow the tomatoes in Euan? A certain compost? Add vermiculite? Again, it's really simple Lulu - just a standard seed compost. No vermiculite required. So, how do you know when to pot the little plants on? Easy - when the first true leaves have emerged. And I know it's important to remove trusses as this helps you get a better crop of fruit. When do you do that? The aim is to have a single stem with four or five trusses (the branches with yellow flowers on them.) Late summer remove the top growing tip so all energy is focused on the rest of the plant. Keep "pinching out" side-shoots so the plant can focus on those few branches. There will be less fruit but what you get will have a chance to ripen and be better. As lower leaves wilt remove these to keep the plant nice and healthy. 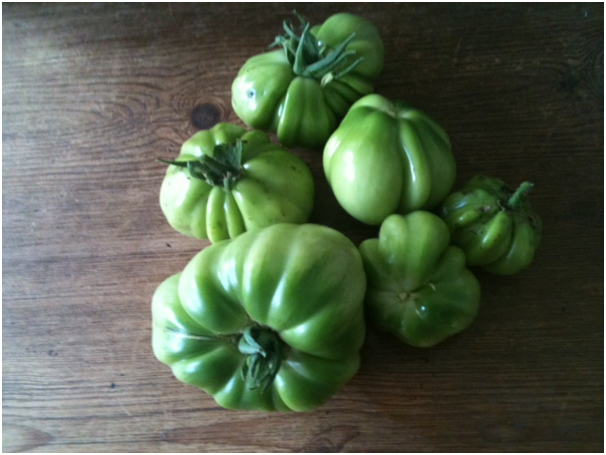 northern gardens but good for bulking out green tomato chutney. 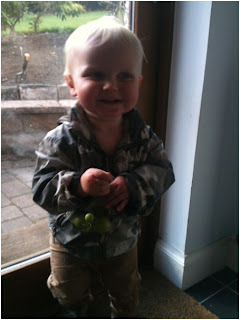 Now Euan, you know better than anyone that feeding is important and not just for us toddlers! When should you start feeding tomato plants and how often? Well Lulu if I was a tomato plant I would want to be fed lots of times a day! But really feeding should start when the first truss (remember that's the branch which will have the yellow flowers) has formed. Everyone has different opinions on the frequency of feeds - some say every couple of weeks, some say more often, some say less. Here's a secret from Grandad though - he cheats by adding a sprinkle of multipurpose solid fertiliser once the truss has formed in order to reduce the work. Does your clever Grandad have any other tips he can share with us? Grandad says nip out any side shoots that grow between main stem and side branches on cordon varieties to ensure growth goes to fruits. Obviously don't do that on bush varieties. If you are lazy and leave doing this until the side shoots are about 4-5 inches you can actually turn them into new plants. Place the removed shoots in plain water on your window sill for 1-2 weeks until good roots form then you can pot it into compost. But you can only do this early in season (or if you have a heated greenhouse) otherwise won't have enough time for tomatoes to form and ripen. your (98!) tomato plants well watered! Well, most people store their tomatoes in the fridge which they shouldn't. They taste much better if they are kept at room temperature. Or even better, keep them on the vine until you need them and eat them straight from the plant. Also, my mummy knows a thing or two about tomatoes and cooking. 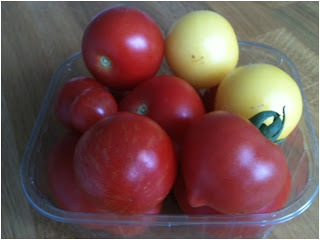 Because we live in Scotland where it isn't always as hot and sunny as we would like, sometimes tomatoes don't get as ripe as we would like. However, don't despair! Nothing gets wasted in our house so Mummy just turns under-ripe tomatoes into some tasty green tomato chutney instead. Here is her very own recipe which she has kindly shared with you all! Place in a saucepan with all remaining ingredients. Bring to the boil and then simmer for about 2 hours, stirring occasionally, especially in later stages as it can stick/burn easily, until excess moisture has gone and a spoon drawn through leaves a distinct channel. Spoon into sterile jars with vinegar-proof lids. Once opened, store in fridge and eat within 1 month. 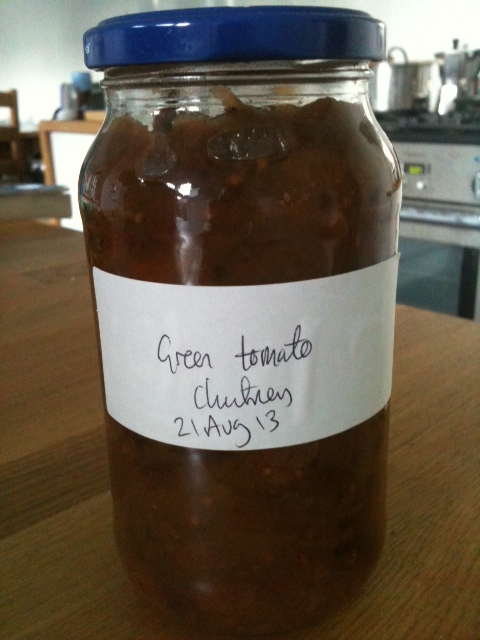 The end result - a jar of lovely green tomato chutney. Do we really have to wait 2-3 months Auntie Alison?!? So there you go, Euan and I have hopefully answered all your tomato questions. If you need any more advice whether it's on tomatoes or gardening in general please get in touch and we will be happy to help! If you have enjoyed this chutney recipe, read about our yummy Rhubarb Chutney recipe. 1. I find having a few red ones in the mix adds depth to flavour. 2. Normally a mixture of sultanas and apricots. 3. 2-3 months - that's like forever!